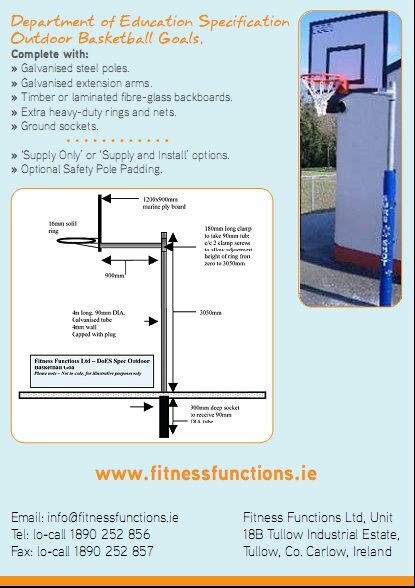 Fitness Functions have supplied & installed numerous Outdoor Basketball sets to primary and secondary schools all over Ireland which conform to the Department of Education Outdoor Specifications. Sometimes we only supply the school with the outdoor basketball equipment and they install & assemble the outdoor sets themselves. We have advised many schools on outdoor basketball issues. Below please see some important points which should be helpful. Install ground sockets at correct locations. If basketball court is unmarked check with architect or client for clarification. Each basketball socket requires hole size of min 500mm diameter and approximately 900mm depth. Ensure the basketball socket is set level with ground after installation. Concrete should be painted after installation. Vital: it is essential that ground sockets are correctly installed to ensure basketball poles are upright. Court size; sockets should be set 28m apart where possible, but at least 1.m from end fences/walls. If necessary reduce court size to allow adequate safety runoff. Allow basketball sockets to settle for a minimum of 48 hours before assembling the goals. Two adults should assemble the units. First place extension arm over the upright, lock the arm to the pole at approximately 4ft. Now, the board and ring should be attached to the basketball extension arm using the bolts supplied. Ensure the basketball board is level and plumb. Black target box should be towards the bottom of board-top of ring should line up with bottom line of small rectangle box (150mm from bottom of board). Using a step ladder and bracing bar, bring the basketball board/arm/ring combination to the correct height. Lock the grubscrews/bolts into position using allen key/19mm ratchet. The correct height from ground of the basketball ring is 10ft for seniors and 8ft6” for juniors. Inspect the goals at regular intervals and tighten bolts where necessary. Check basketball safety padding for damage. Children should not climb on the framework and should not be unsupervised using any sports equipment. Two competent adults are required for this assembly.